 Harley-Davidson XA - Мотомир Вячеслава Шеянова | This work is licensed under a Creative Commons Attribution-NonCommercial-NoDerivatives 4.0 International License. 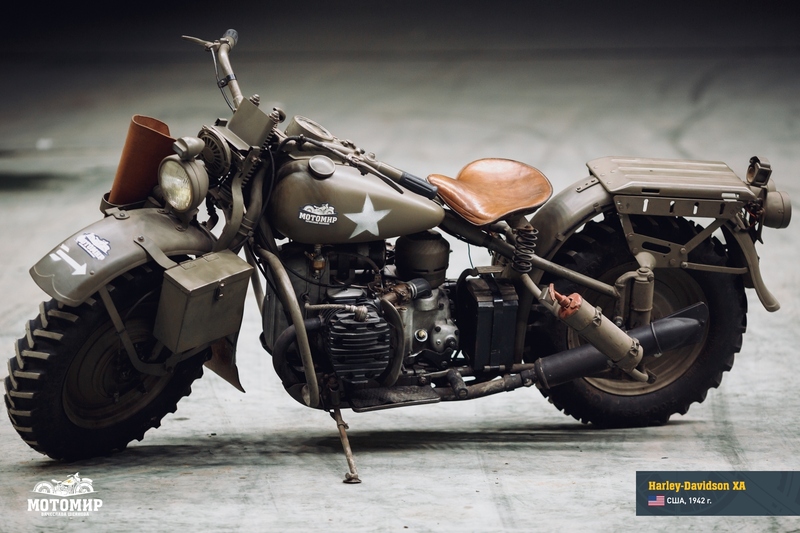 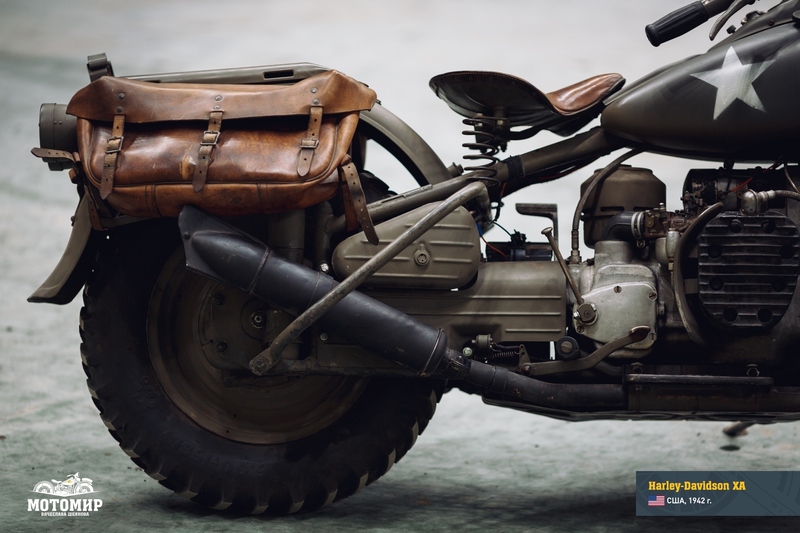 In 1941 Harley-Davidson got a US Government contract for the development of a new motorcycle designated for military operations in North Africa. 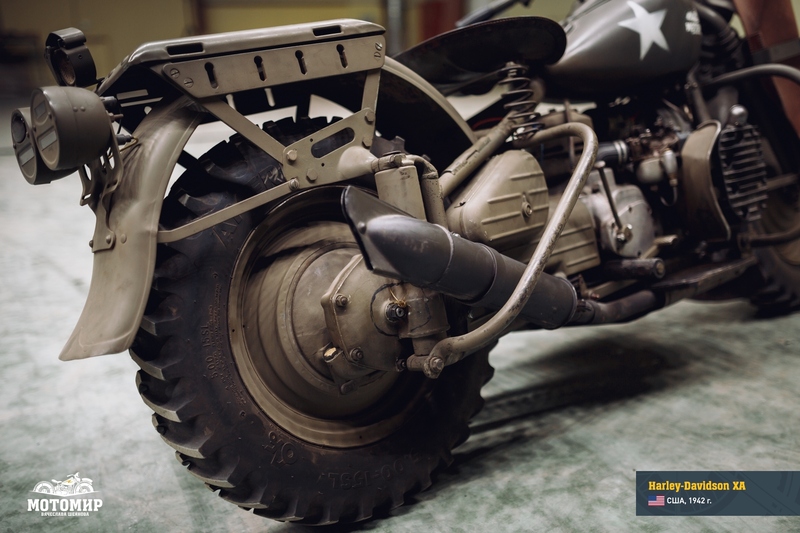 Model WLA which was already delivered to the US Army did not have one important feature which was critically important under the severe conditions of moving in dust and sand: the shaft drive. 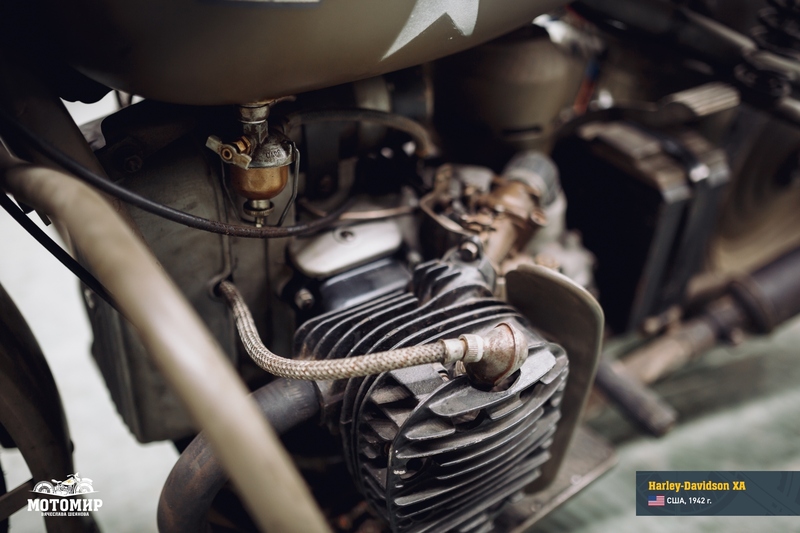 Thus Harley-Davidson XA was born (XA means “experimental, army-use”), and this was a motorcycle that had little in common with the main Harley-Davidson product line-up, even though it was outfitted with a twin-cylinder, horizontally-opposed engine, that was practically identical to the 739 cc engine of Model WLA. 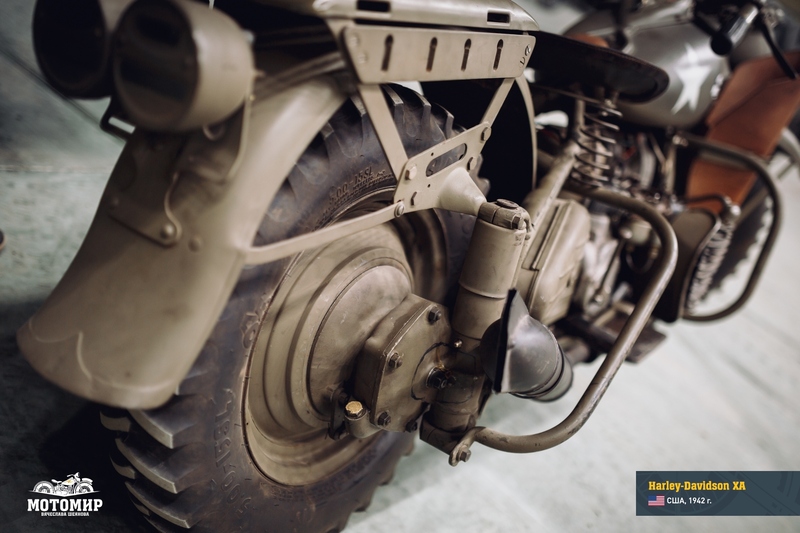 By 1941 German engineers have already learned that the exposed chain drive gets quickly disabled under desert conditions and that using shaft drives is the only way to reliability. 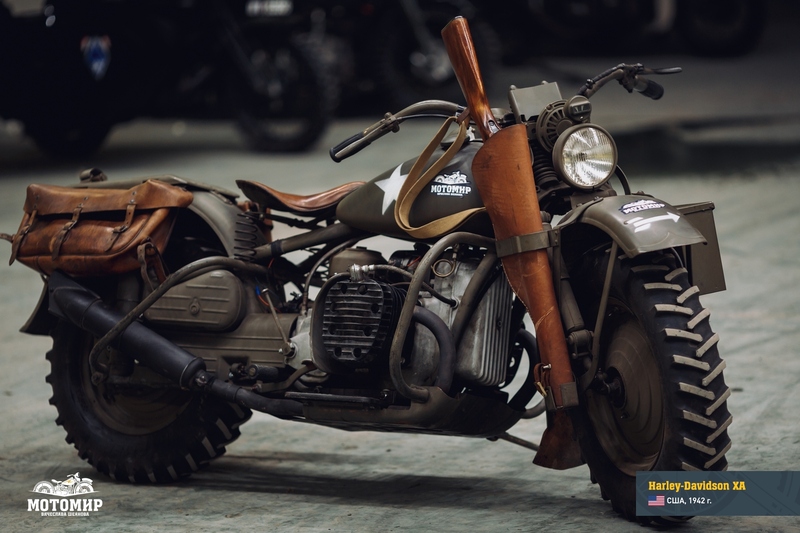 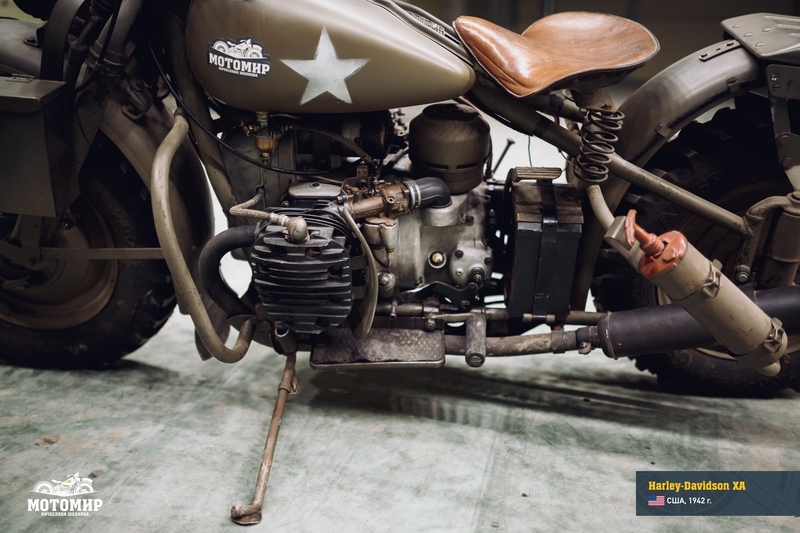 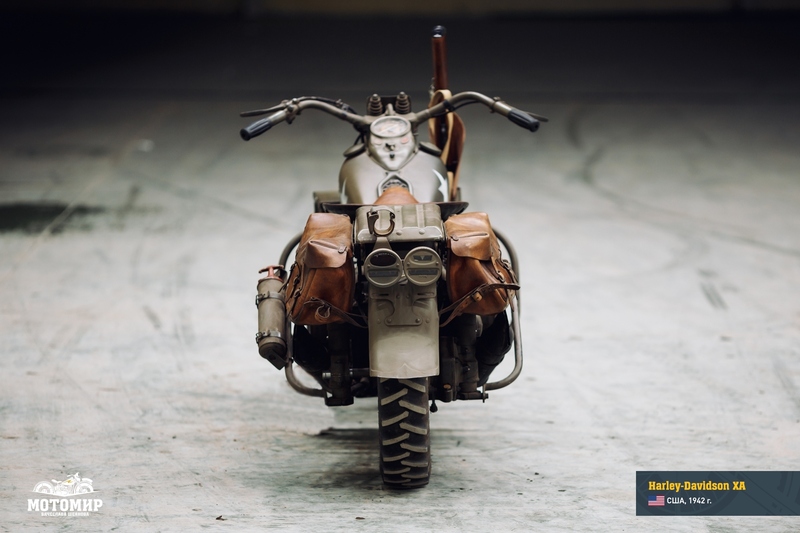 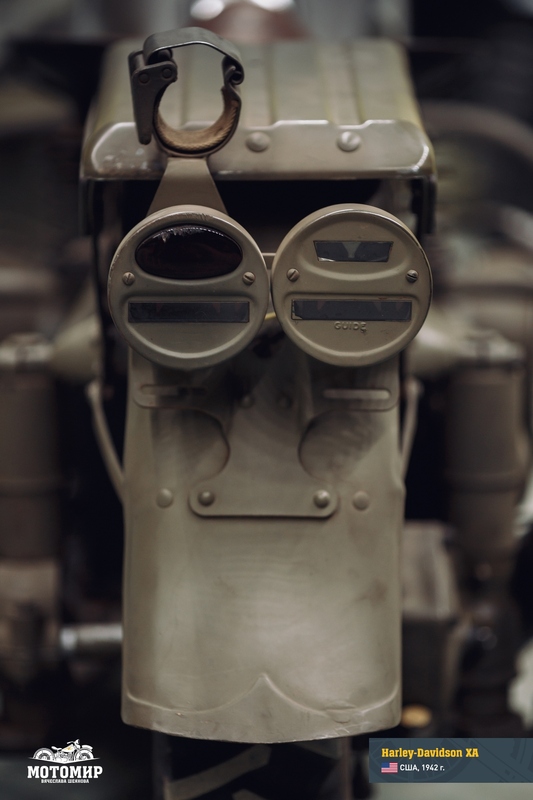 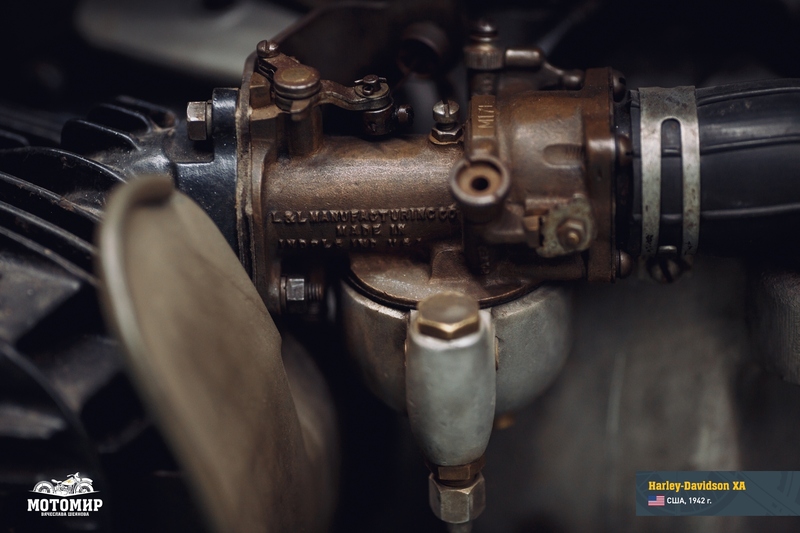 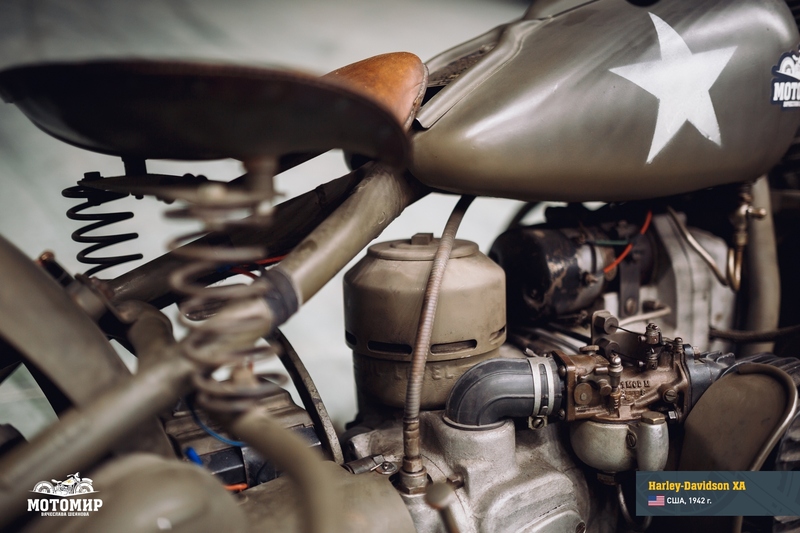 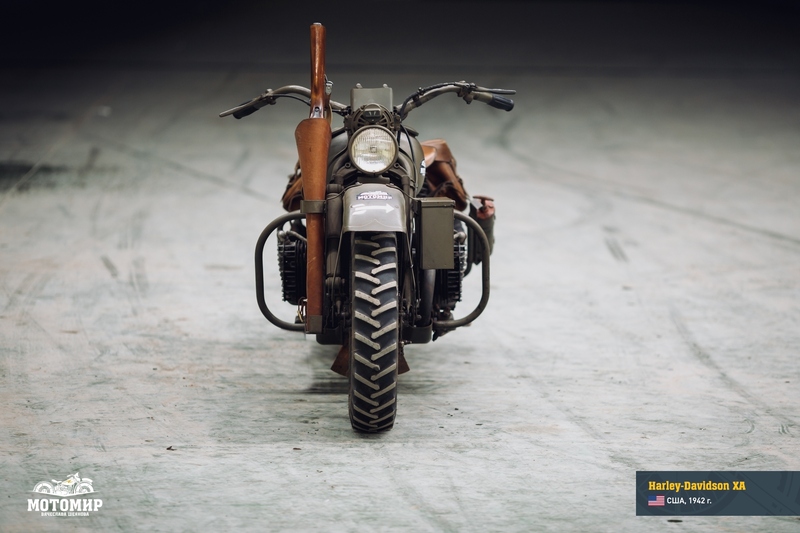 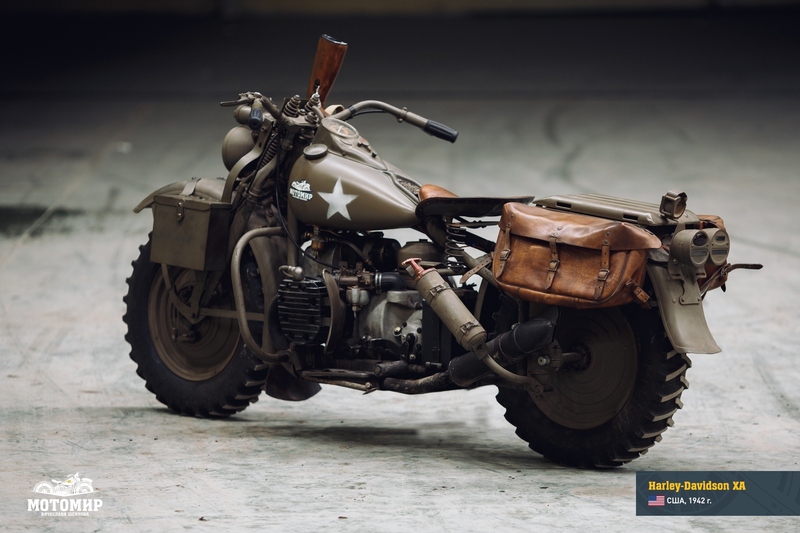 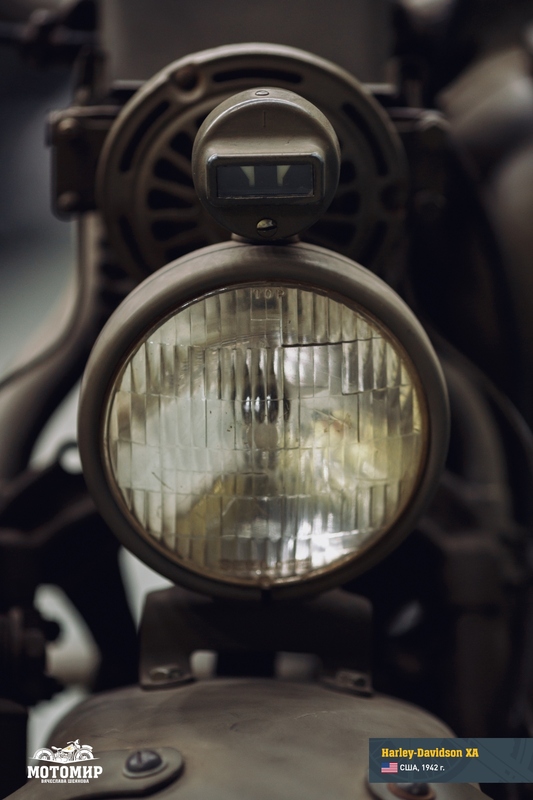 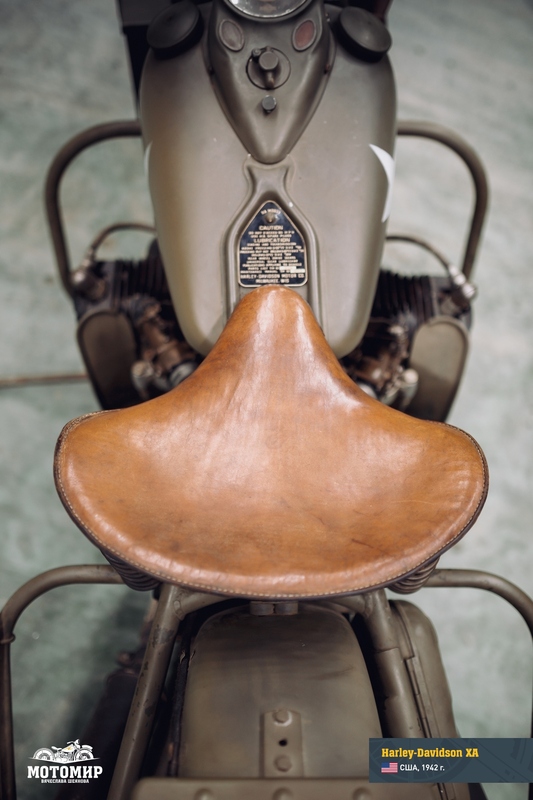 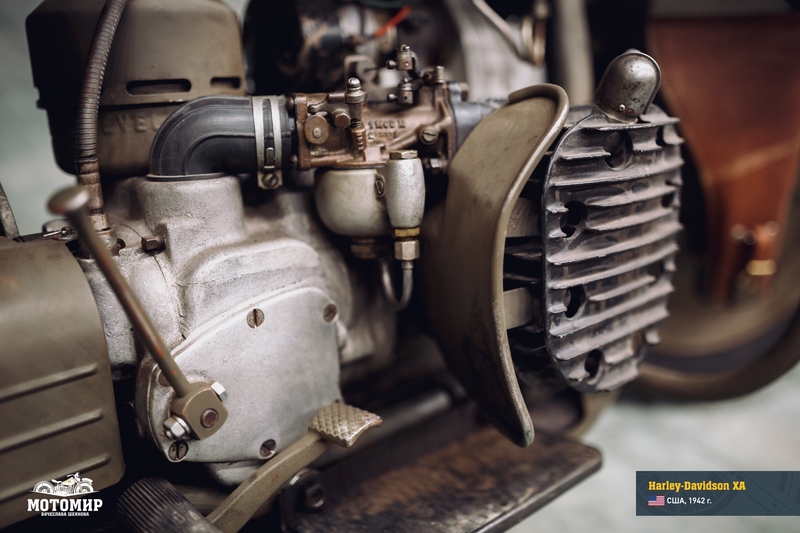 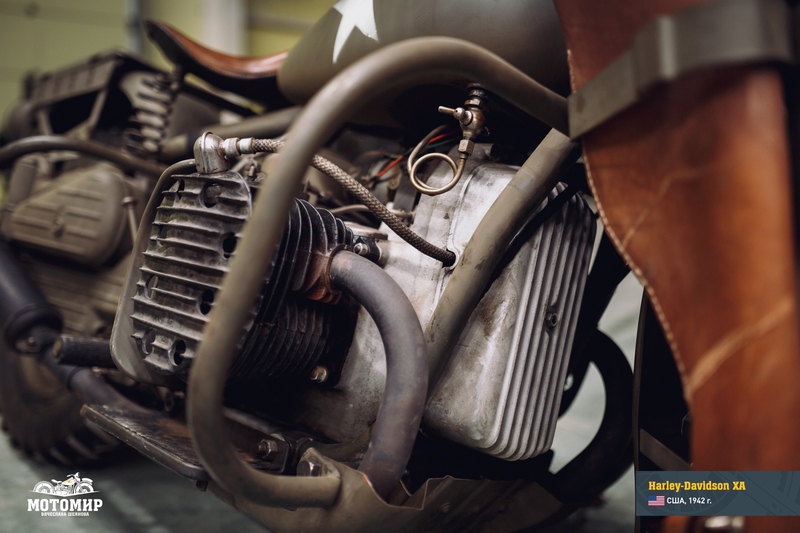 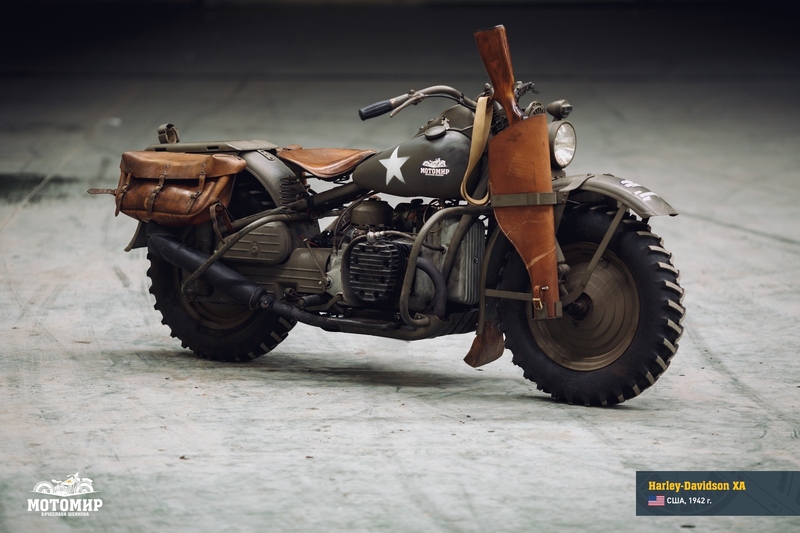 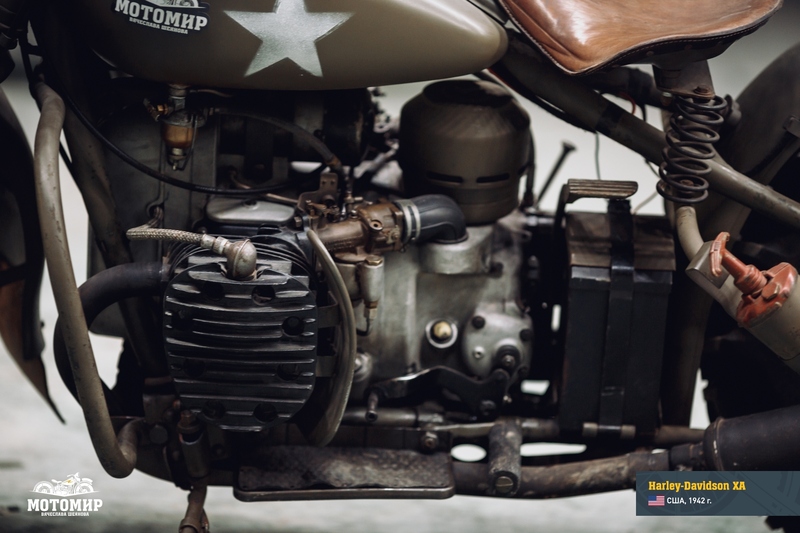 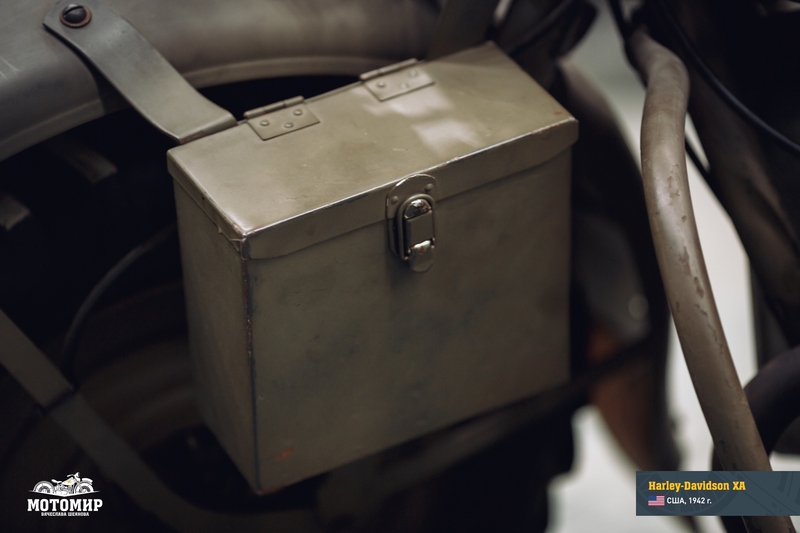 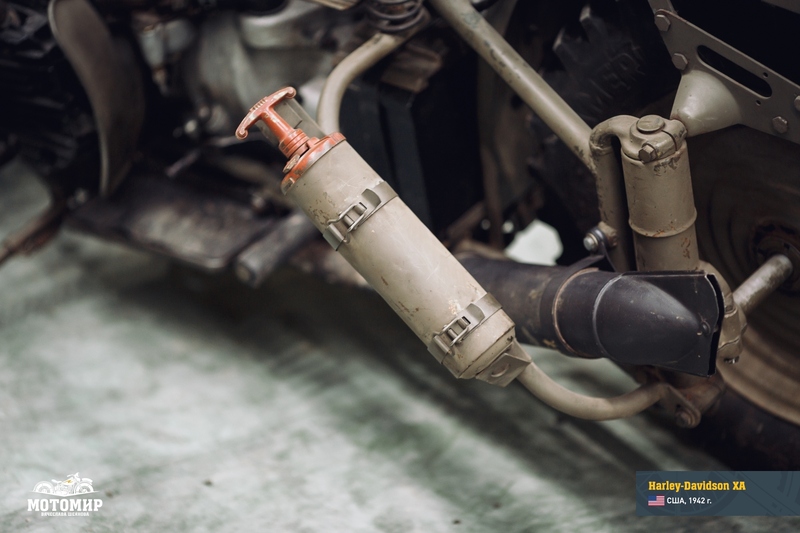 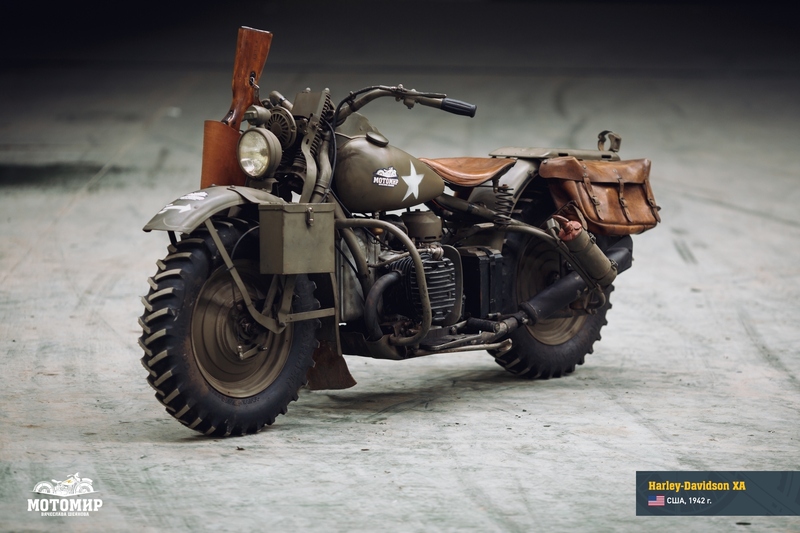 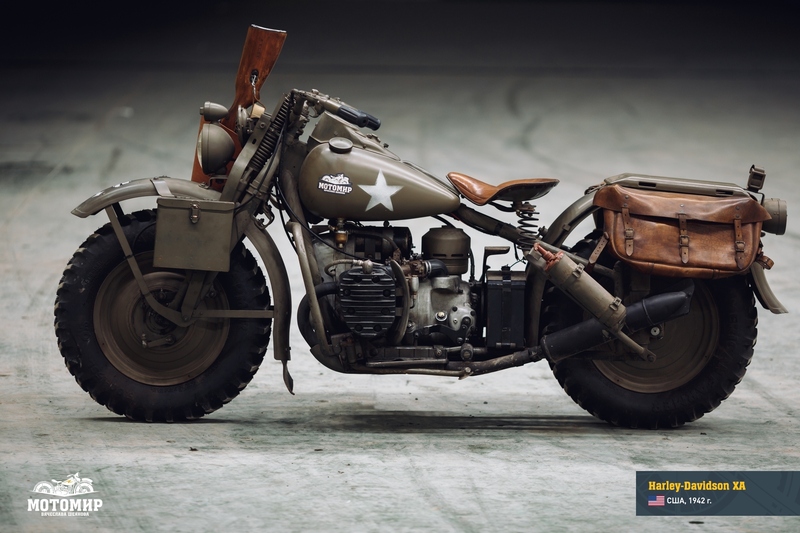 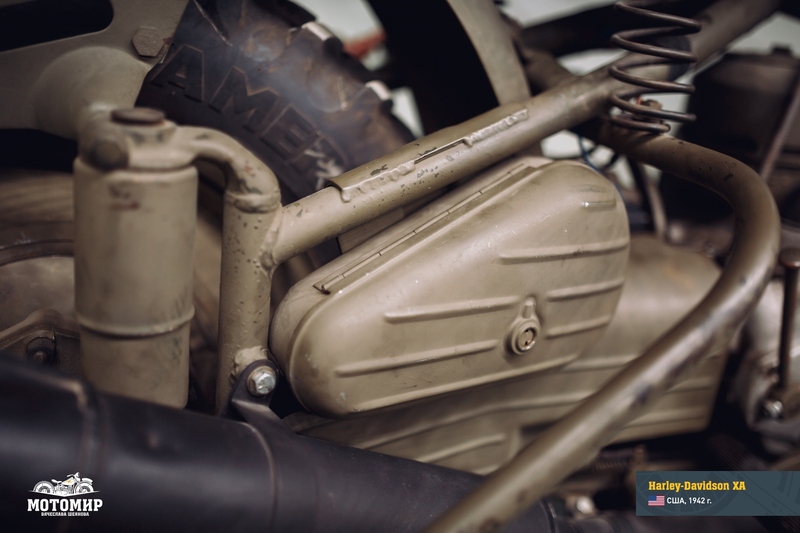 This why John Nowak, XA’s designer, decided to apply Wehrmacht’s engineering research and, practically speaking, made his XA a copy of some captured BMW R71 (some sources say that it was rather R12), a machine successfully used in the military campaign by Hitler’s African Corps. 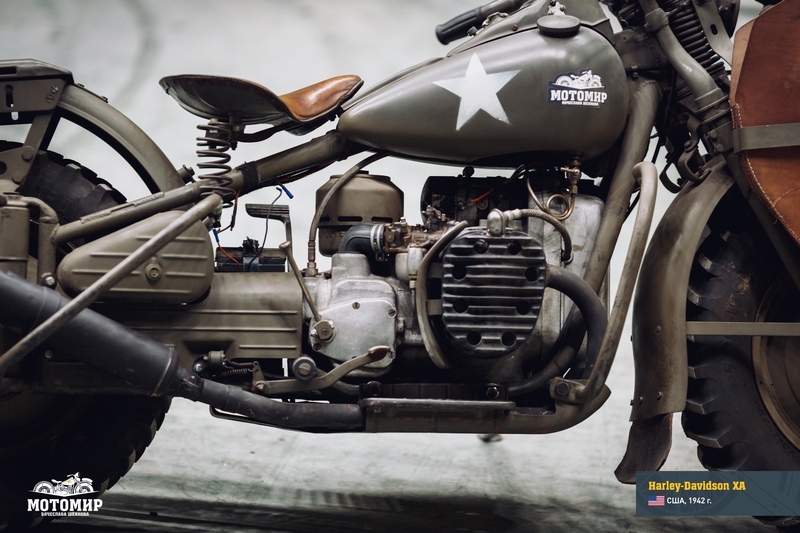 As an experiment, a variation of Model XA was designed in 1942 that was dubbed Model XS: its main difference from the XA was a sidecar with a drive wheel. 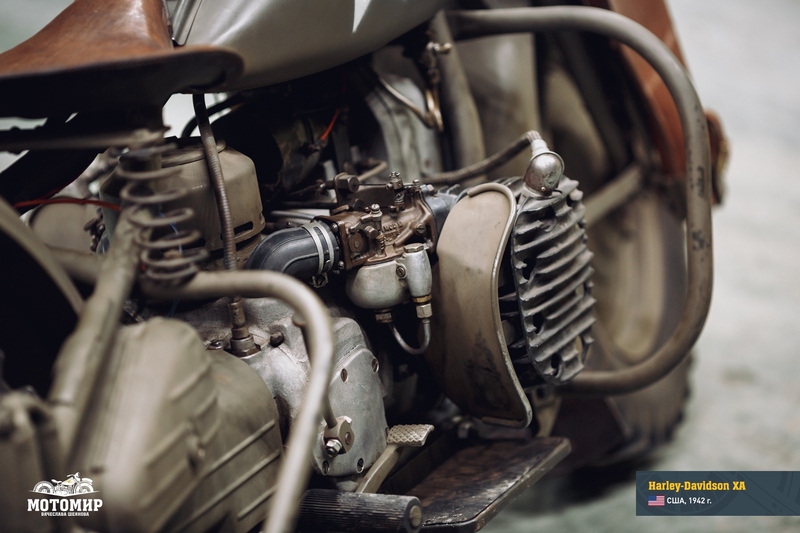 The transmission to the sidecar wheel was done by a transverse shaft driven by crown gear and pinion gear. 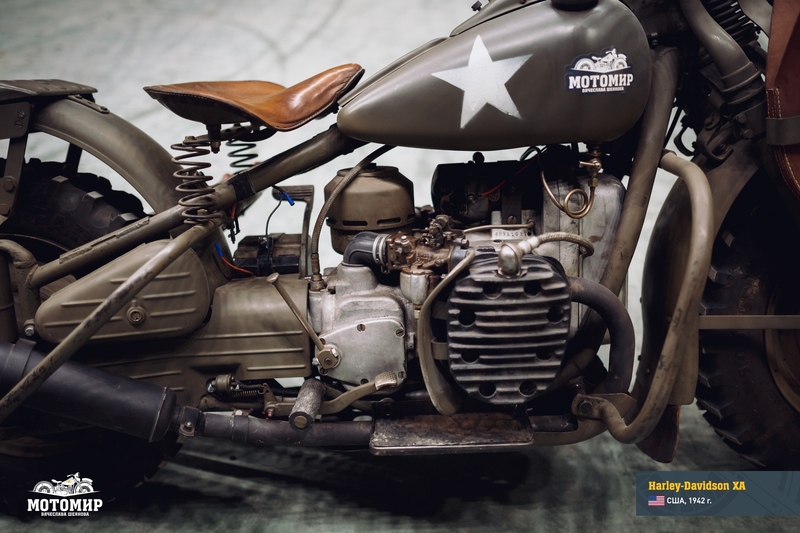 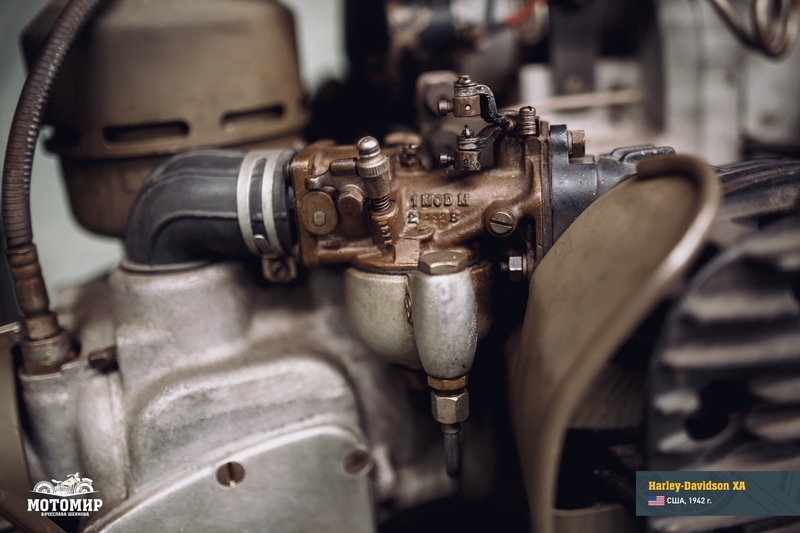 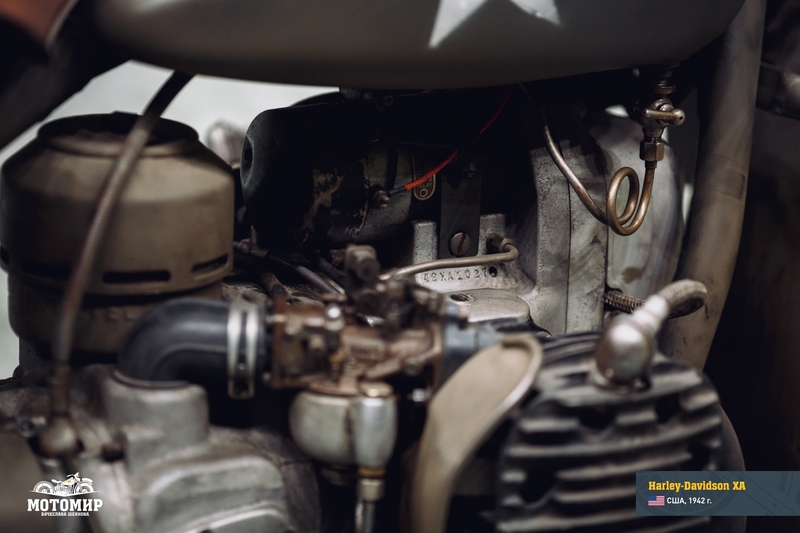 Besides, several modifications of the basic XA model were effected, including using Firestone tractor-type tires, outfitting the motorcycle with a second seat, as well as installing the exhaust system higher than that of XA. 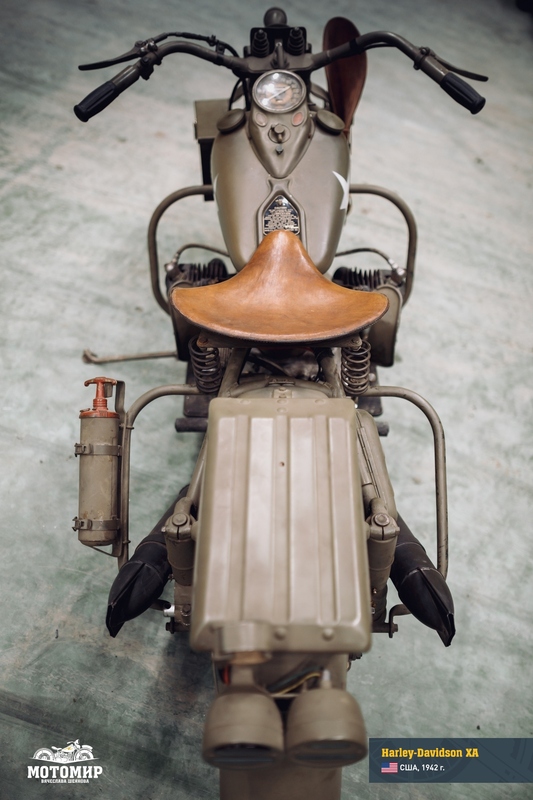 The sidecar was very unusual as compared to standard civilian types: it had an opening on one side in the style of Jeep automobiles plus a mudguard and a locker. 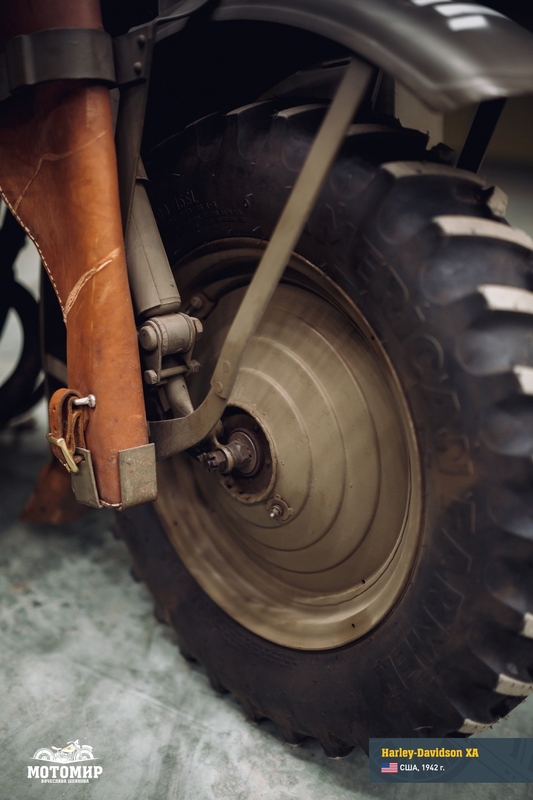 A spare wheel was affixed to the back side of the sidecar. 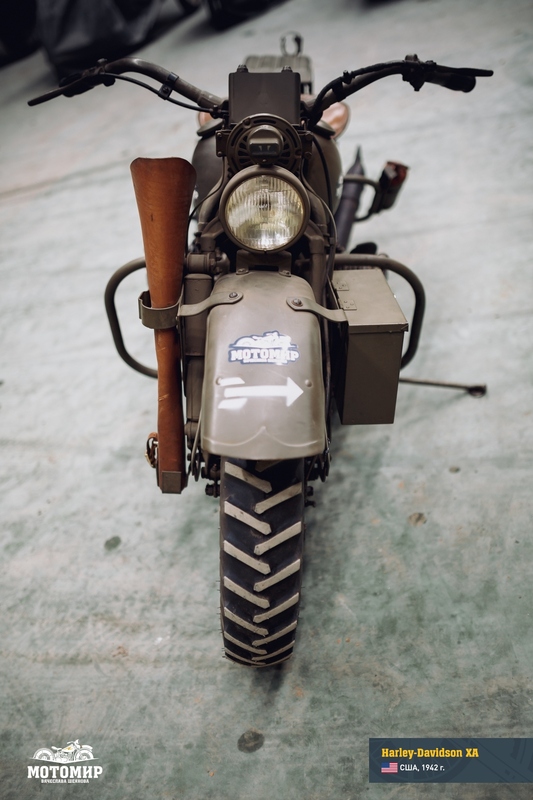 By the time when the US government was ready to sign a contract for motorcycle delivery, the war in North Africa was over. 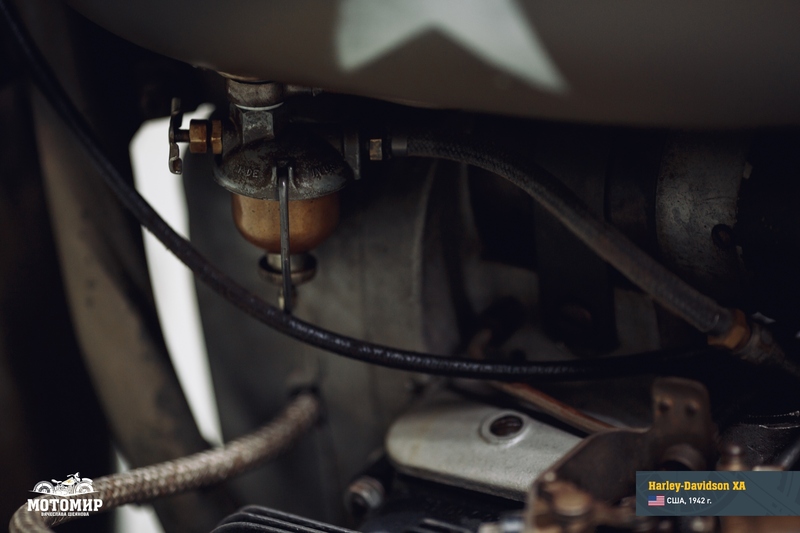 Also the Jeep was already successfully coping with the tasks that Model XA was supposed to be solving. 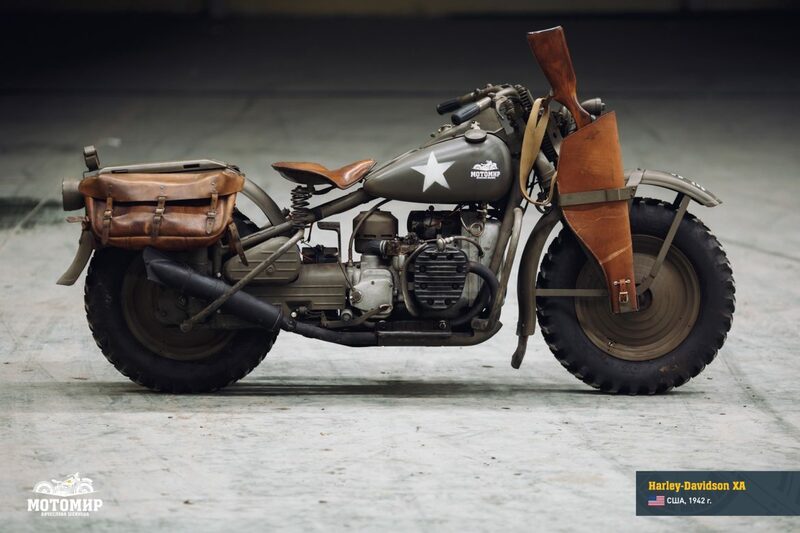 This is why the project for the desert motorcycle was terminated in 1943. 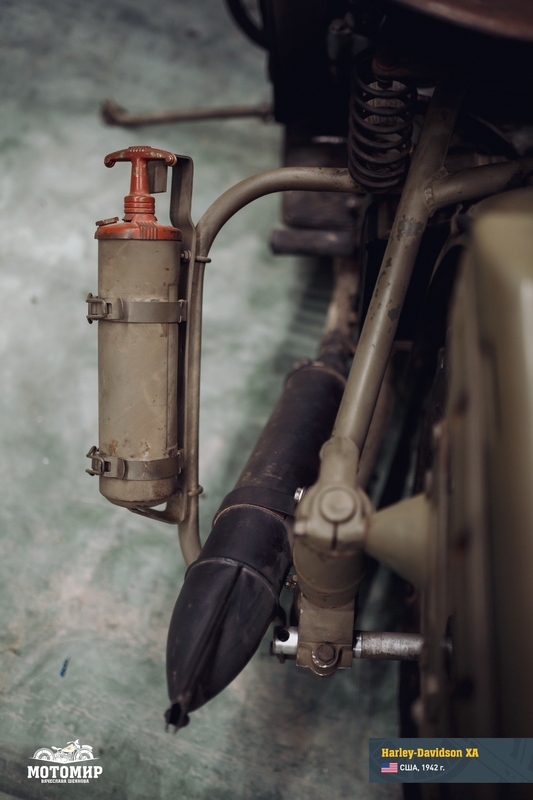 A total of 1023 units of Model XA were produced. 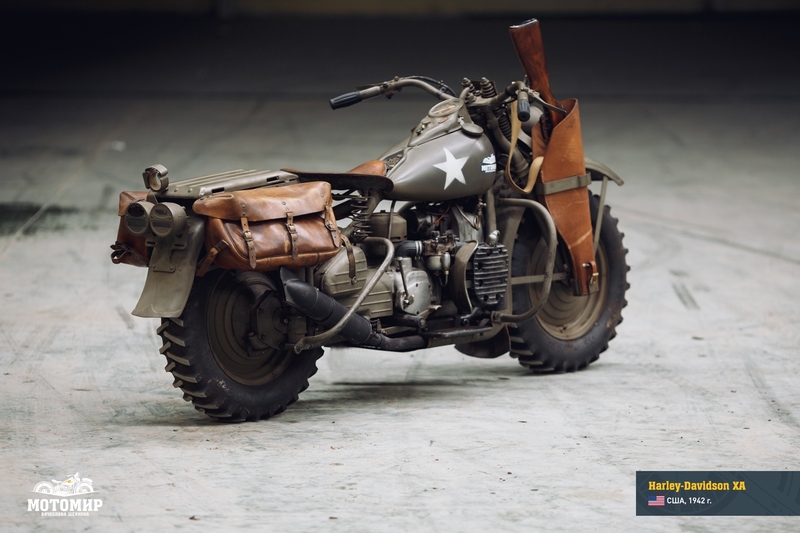 Of these, as per archive records, only 3 motorcycles were upgraded to Harley-Davidson Model XS.